The first phase of a £927,000 project to transform a Pembrokeshire harbour into an international marine tourism destination has opened. The project to revamp Saundersfoot has already been awarded £463,500 in European regional funds, as well as £200,000 in tourism development cash. The rest of the funding is being met by the Harbour Commission. Deputy Minister for Culture, Ken Skates, opens phase one - the new harbour decking area - on Wednesday. The project also includes a new slipway, sea wall, visitor pontoon and dry boat racking facilities. 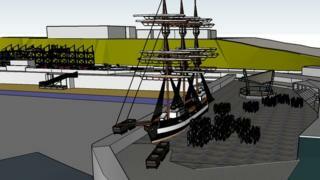 The harbour project is the first part of a £4m scheme to boost tourism and jobs in the town. Mr Skates said: "Saundersfoot harbour has long been recognised as one of the jewels in the crown of Pembrokeshire. "This development will help establish a reputation for the harbour as a high-quality international marine destination and make it an iconic tourism destination for Wales."